The woods in general and specifically deer keep a different schedule than our 9-5 rushed workday. The wilderness, even small farm lot wilderness, lives at a much slower pace than modern man. This is both the beauty and the challenge of hunting. To match or even slow down the pace of the woods is difficult for many hunters, yet success in the deer woods requires it. One of my hunting partners is quite a go getter in his day to day life and translates it with some success into hunting. Generally though he spooks a lot of game before he encounters a situation where he can get the drop on them. He related a story to me over lunch at the edge of a wilderness area one afternoon on of the morning hunts. He had come upon two does resting in his path and stopped to watch. The does were close and he knocked an arrow just in case there was a buck nearby. After ten minutes, his frustration at being stopped by the does started to build and he decided to slip past them and continue his hunt. Upon putting away his arrow and taking a couple of steps forward, the deer moved. Not the does but the large 4×4 mule deer bedded within 35 yards! The trouble is clear, to jack ten minutes of standing still is a long time. The deer might lay to rest for 10 minutes or 3 hours. While it might seem unreasonable to spend 3 hours watching a couple of does at first glance, in some situations it isn’t. 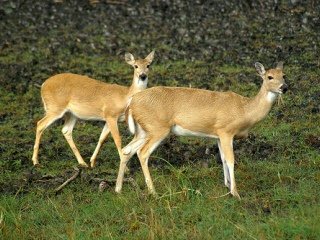 Deer for the most part live a very slow paced life with relatively few moments of extreme action when they encounter a predator or fight for dominance. They hang out in the woods and eat and drink without disturbance. The few moments of extreme action however put them on alert for potential dangers. Since the deer are alert and living a fairly slow lifestyle, hunters need to adjust their still hunting accordingly. The ultimate adjustment is stand hunting where we just wait for them. Although there is a time to run and a time to walk quickly, for the most part the slower you hunt through prime areas, the less you will be detected. Adopting a pace even more slow and purposeful, including long stops in likely areas, allow the pace of the woods to be actually faster than the speed of your hunt. Hunting like this in good habitat will ensure that you see the deer’s movement more than they can see yours.